Posted On November 17, 2014 by Team iCynosure. A few days ago, I was asked, "Can Health be Fun?" My first thought on that was what is FUN? Well in simple lay-man language Fun is any activity that allows for entertainment, makes it enjoyable or gives me an adrenaline rush. My second thought was what activity entertains me, something I really enjoy that not only gives me an adrenaline rush but also adds positively to my health. Apart from a zillion things that came to my head the only activity that I actually look forward to day-in-day-out is Zumba. I see you smile; yes you are right it is fun, it is crazy and above all it is healthy. Zumba is a giant party. Especially for the uninitiated, Zumba is a fun-infused fitness program where you spend the whole time shaking your booty to music to achieve a healthier you. Forget the treadmill or the weights in the gym, all you need for a Zumba class is yourself and an attitude to move your body. When I signed up for Zumba at the insistence of a friend, I had no idea what I was getting into. I assumed it to be rhythmical, step-for-step and choreographed. But it was the exact opposite. None of my previous dance experiences helped much. Zumba, which actually means ‘to move fast’ is a closely associated with the word Rumba which means ‘to party’ in Latin. The first few classes I just kept waving my hands and kicking my legs around all the time. It was a slow progression to following the steps, while all the time you are laughing and having fun. My fear of being laughed at, made fun of disappeared in the second week when I realised most of us were in the same boat, just out there to have fun and not to judge anyone. The more we kept at it, the better we got. During the sessions, I just go crazy dancing without bothering to check with it’s doing for my body and health. But I haven’t been disappointed. Zumba fun has taken me to the doorstep of Health, the moment I forgot to count the calories I was burning and just started having fun I’ve lost more than I would have bargained for. So my mantra for having Health fun is very simple…. Let Yourself Loose, Party Your Time Away, Have Fun! I’m hooked to Zumba, for a fun-filled Health Regime. And You? The least you could do is changing the cookies in your kitchen with Sunfeast Farmlite, especially with their amazing campaign ‘Health is Fun with Farmlite’ which is driven by the Farmlite Bytes Film festival. The films created are so much fun as they push you to change your lifestyle for better whilst incorporating simple day-to-day activities. Contrary to popular belief, these films are pretty short and convey the message in a humorous unconventional manner. Goodbye Bai is a fantastic take on the so-called modern home scenario in India. So dependent have people become on their maids, that a day of absence creates chaos. Here is a simple resolution to the problem while getting healthier and fitter! This short film is so close to my heart, as it speaks the language that I completely understand. Why not have many more such festivals that help us get fitter rather than those that only pile on kilos? And I've saved the best for the last. Every couple lives this life, and those who say they don't are plain lying. And since I face similar situations time and again, this modus-operandi is something I must incorporate into my life to win the marital battles. 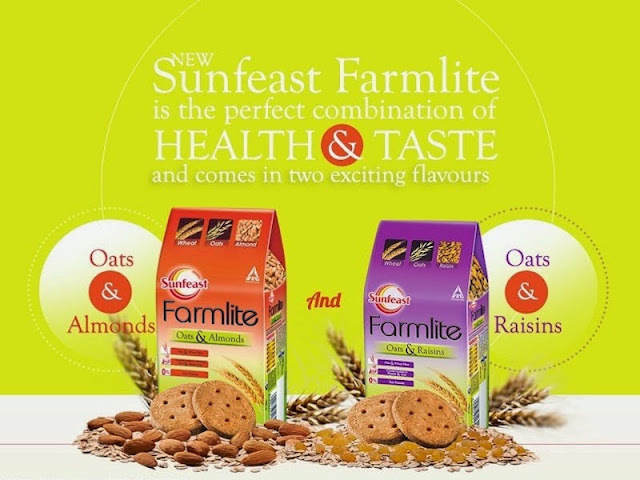 About Sunfeast Farmlite: ITC foray into the biscuits market was with the launch of the Sunfeast range of biscuits in 2003. The range is a healthy option in the segment made with Oats and Wheat. Available in two flavours Oats with Almonds and Oats with Raisins, the cookies are not only tasty but also healthy. They are…. So my answer is, Yes Health is Fun with Sunfeast Farmlite! How do you make your heath fun?